Title: 'India quae Orientalis dictur et Insulae Adiacentes'. A large-size and beautiful copper engraving map out the "Atlas Novus" by Johann Janssonius. This map shows India, Indonesia and South East Asia as well as the adjacent areas. The map is decorated with beautiful cartouches. On the back you find latin text. 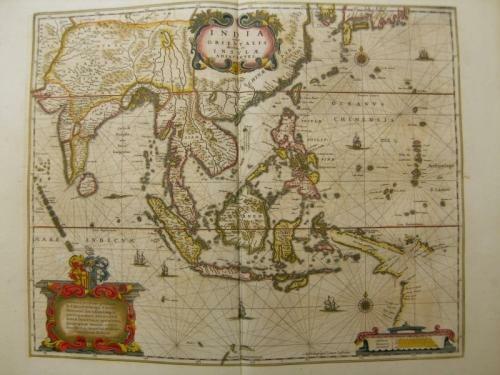 In very good condition - very slightly toned and one repair at the lower centerfold outside the map.